In a post on December 26, I presented the average tax rates that would follow from the tax plan proposals of several of the main Republican candidates. These were radical proposals, and would move America from the progressive tax structure it has always had (even under Reagan and Bush), to regressive taxes where the rich would pay at a lower rate than the middle class or (in the case of Cain) even the poor. The calculations were done by the Tax Policy Center, a joint program of The Urban Institute and Brookings, and I simply presented their results graphically. At the time of my December 26 post, the Tax Policy Center had only worked out (using their Microsimultation tax model: see my earlier post) the implications of the proposals of Herman Cain, Rick Perry, and Newt Gingrich. They have now (as of January 5) also worked out the implications of what Mitt Romney has proposed. 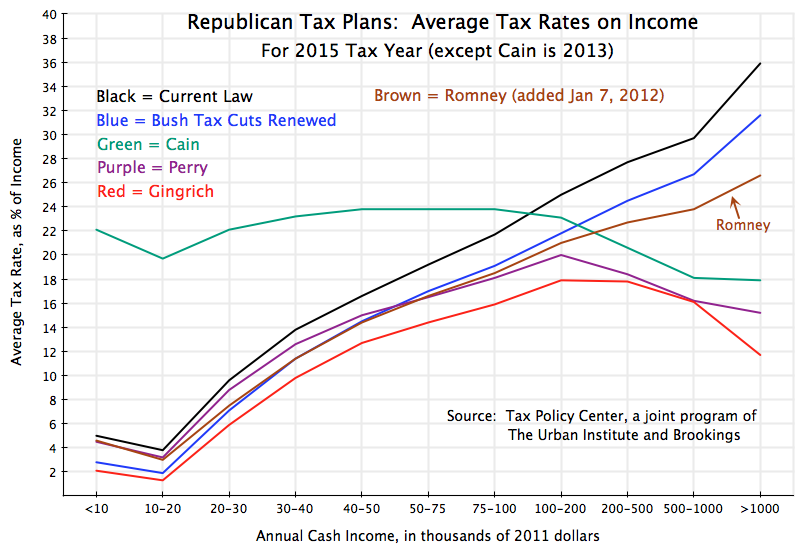 These tax rates are added in the diagram above (in brown). As I noted in my earlier post, Romney’s proposals are in the same direction as those of Gingrich and Perry, but less extreme. His plan would still lead to major reductions in the tax rates for the rich, especially the super-rich, although not to as low a rate as what Cain, Perry, and Gingrich have proposed. And the overall tax rates would at least remain somewhat progressive, in contrast to the proposals of the others, but substantially less progressive than what they would be under either the current law (where the Bush tax cuts are allowed to expire as currently scheduled) or even what they would be if the Bush tax cuts are extended. Under Romney’s proposal, those earning less than $30,000 per year (the very poor) would in fact pay more than they would should the Bush tax cuts be extended, while those earning between $30,000 and $50,000 would pay the same as under Bush. But above $50,000, the richer one gets the less one would pay under Romney’s plan compared to what one would pay under Bush (and even less compared to what one would pay should the Bush tax cuts not be extended). With the lower tax rates under Romney, especially for the rich, overall tax revenues would of course fall. The figures calculated by the Tax Policy Center indicate revenues would be $600 billion less under Romney’s proposal in 2015 alone. The ten year loss (where ten year figures are what are being used in the fiscal deficit discussions) would be more than ten times this, i.e. more than $6 trillion. Although a bit less than half the loss under the cannot-be-serious Gingrich plan (which would lose $1.28 trillion in 2015 alone, or a loss that could not be covered even if one cut all federal government discretionary expenditures to zero), Romney never indicates what he would do to make up for this $600 billion annual loss in revenues. Yet he repeatedly states in his campaign that it is critical to cut the fiscal deficit. Romney claims to be a good businessman, but a plan that cuts tax revenues by $600 billion a year, equal to close to half of all government discretionary expenditure (including the military), is not serious. This entry was posted in Fiscal Issues, More Political than Economic and tagged fiscal deficit, policy, tax system, taxes by aneconomicsense. Bookmark the permalink.